This fairing bolts onto the factory windshield brackets. Please let us know in the "Details" section what type of speedometer you have and its location. Models with the Retro speedometer 2006 and up use factory windshield brackets, but need to take the top 2 spinners or grommets off and use bolts and washers to hard bolt the top. The bottom spinners stay on. 2005 and older have their speedometer on their tank. 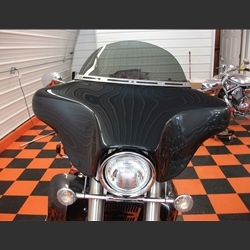 Paint inner and outer fairing Satin Black. Install sound system if purchased. ALLOW 2 - 4 WEEKS DELIVERY.